Yoga on desert islands, sailing in one of the world's best sailing environments, vegan or vegetarian organic board while cradled on a sailboat between Italy and France and swims, SUP, snorkeling around breathtaking waterscapes are some of the selected ingredients that make our perfect holiday. Bring your spirit back to the now: practice asanas, pranayama, meditation and learn to set sails and steer the boat with our competent instructors. Regain clarity and strength and disconnect from the digital world surrounded by turquoise waters, wind-shaped granite stones and sunny desert beaches reachable only by boat. Your dream holiday is guaranteed. Namaste. MIZAR 3 is a JEANNAU 52.2 with four comfortable double cabins with private bathroom, a fully equipped kitchen and a dining area with leather sofas, teak interior and stereo. Furthermore, MIZAR 3 is equipped with a chart table with all the necessary equipment for safe navigation. On deck, you can eat in the shadow of the awning, lye in the sun, use the snorkeling equipment, SUP or the dinghy to reach the fabulous Sardinian beaches. VHF, log, autopilot, eco, GPS, plotter, radar, ais, Epirb, 12-volt system, 220-volt system, generator, wheel, boiler, 2 electric refrigerators, stereo-CD. JEP VI is a Beneteau First 51, with three comfortable double cabins with private bathroom, a fully equipped kitchenette and a dining area with leather sofas, teak interior, plasma TV, and stereo. Furthermore, JEP VI is equipped with a card table with all the necessary equipment for safe navigation. On deck, you can eat in the shade of the awning, lye in the sun, or use the dinghy to reach the fabulous Sardinian beaches. Chia, like the seeds, seems the perfect boat name for our retreat. It is the older sister of Mizar 3, so simply go back and read Mizar 3 features and imagine a slightly older (but more charming) boat. In case of unpredictable causes (Force Majeure) make either Mizar 3 or Jep VI or Chia unavailable for the holiday week, Yogaandsailing will organize the yoga and sailing week on one of the other 2 boats or - should they be unavailable - on a similar boat with the same if not higher equipment as the unavailable one. Cradled all night at anchor in a quiet bay, the early birds watch the sunrise on the deck, the rest wakes up as soon as the coffee aroma spreads around the sailboat. On a different island every day we practice yoga at the beach or dock, with the sea surrounding us. After yoga, we swim back to the boat for our freshly prepared, organic vegan and/or vegetarian brunch*. Then we set sail to the next destination. The afternoons are dedicated to sailing, swimming, snorkeling, stand up paddling, sunbathing and sightseeing. At times we add a yoga practice in the early evening. Most nights are at anchor in quiet bays of La Maddalena Archipelago and of South-East Corsica, away from the crowds. Mid-week we spend one night in the harbor of Bonifacio, the city of cliffs and France best-kept secret. Experience in yoga is not required. A yoga class starts with breathing exercises, to get in tune with our body and the nature around us. A more or less dynamic practice follows, tailored to the needs of the group. The background waves rhythm increases our concentration and creates a special atmosphere for the final relaxation. An evening yoga practice and meditation can be incorporated into the program if the group wishes so. I've never been on a boat! If you are an experienced sailor, we welcome you to help us run the boat if you have limited experience this is the chance to learn if that appeals to you. The sailing instructor will help you understand the basics with a lot of humor and assistance, you'll never be left alone steering the boat! Alternatively, simply leave the boat to us and chillax on deck. No meat, no fish, no alcohol? Mid-week you have a chance to get your meat/fish/alcohol doses in a restaurant in Bonifacio, where we spend the night and visit the citadel. Also, our last evening is usually in Cannigione harbor, where we book a table at our favorite local restaurant with Italian and Sardinian fish specialties. The itinerary: one week at the mercy of the wind Gods! The itinerary of each yoga and sailing retreat is slightly different and unique as... we are at the mercy of the wind Gods! We start from Cannigione, a fishermen village just a couple hours sailing to the closest island of La Maddalena Archipelago and we do our best to take you to the most beautiful bays, beaches, and corners of this paradise. We are in one of the world's best sailing environments, the wind is pretty much guaranteed. We simply don't know where it comes from yet, therefore, the sailing plan is set on a daily basis. North-East Sardinia, La Maddalena Archipelago, Bonifacio, South-East Corsica 45 sea miles in total, corresponding to a sailing duration of ca. 24 hours. Saturday: Breakfast on board, check-out around 9 a.m.
Our start and end point are Cannigione, a small fisherman village in the North-East coast of Sardinia, perfectly located to reach the islands of La Maddalena Archipelago in a few hours sail. The boat is docked here all year and we know the area very well. On our last evening, back in Cannigione harbor, we book a table at our favorite local restaurant with Italian and Sardinian specialties, can take you to farmers if you wish to bring home some Sardinian specialties and enjoy our last evening together back to where we started. La Maddalena Archipelago is the only Italian Geomarine National Park and comprises 7 main islands and many smaller ones. All within easy reach of one another (if you have a boat), they make the sailing easy through crystal clear turquoise water and consistent winds. The bays all around the islands ensure protection from the wind during the night. Hiking around the islands and to different beaches is guaranteed and we always make sure to show you the famous pink beach of Budelli. Every day is a new adventure through stunning waterscapes and landscapes! Bonifacio, the city of cliffs, is France best-kept secret. The white chalk cliffs ensure a majestic entrance to its harbor and unique views from the medieval citadel and fortress. After a few days at anchor it is always appreciated for some shopping, dinner in a restaurant, and for the French atmosphere, you suddenly experience. Isola Piana, Rondinara and Sant'Amanza bays give us protection from the wind blowing often from North East (the Mistral), it also offers turquoise blue waters perfect for snorkeling or a longer swim. Don't get confused, the names sound Italian as Corsica was once part of Italy, but nowadays c'est la France. The two French islands are so close and so different. They always impress visitors. Cavallo for the exclusive villas belonging to the international jet set and its private airport for private jets, Lavezzi is desert and offers the most incomparable rocky landscape. In Lavezzi, we anchor for the night and we hike together around the island to reach our favorite meditation spot on a beautiful huge rock facing the sunset. Alessandra begins practicing yoga while working between Asia and Germany, realizing more and more the importance of the body and breath in the midst of the stressful office life. With 28 years old, she quits her job and lives half a year in a yoga centre (ashram) in Germany, her first full immersion with yoga. Afterwards she spends one year between India, Bali, and Malaysia, integrating her practice with Iyengar yoga, and also studying Ayurvedic massage. Since 2016 she is studying to become a practitioner of the Grinberg Method, a bodywork therapy. Francesco begins his navigator career in 1994 as a sailing instructor in Sardinia and sailing around the Mediterranean. In 1996, he crosses the Atlantic for the first time and navigates two years a variety of sailing boats between the Caribbean Sea, Venezuela, and the United States. After that, he follows the world tour on a Mauric 64th. Since 1998, Francesco works on yachts from 72 to 110 feet long. He has crossed the Atlantic back and forth 15 times and has more than 110.000 sea miles behind him. He is certified sailing instructor with decades of experience, patience and sense of humor. North of Sardinia, South of Corsica, La Maddalena Archipelago National Park is located on the Strait of Bonifacio. Famous for being one of the best sailing environments in the world, the strait separates Sardinia from Corsica, Italy from France. La Maddalena Archipelago is the only Italian Geomarine National Park and comprises 7 main islands and many smaller ones. One of them is inhabited, the others are desert natural paradises. All within easy reach of one another (if you have a boat! ), they make the sailing easy through crystal clear turquoise water and consistent winds. The bays all around the islands ensure protection from the wind during the night. We will hike around the islands and to different beaches and we always make sure to show you the famous pink beach in Budelli. Every day is a new adventure through stunning waterscapes and landscapes! We cross the Strait of Bonifacio and sail along white chalk cliffs shaping the South East of Corsica to reach Bonifacio, the city of cliffs, France best-kept secret. The white cliffs ensure a majestic entrance to its harbor and unique views from the medieval citadel and fortress. After a few days at anchor it is always appreciated for some shopping, dinner in a restaurant, and for the French atmosphere, you suddenly experience. Oui oui. Isola Piana, Rondinara and Sant'Amanza beaches give us protection from the wind blowing often from North East (the Mistral), it also offers turquoise blue waters perfect for snorkeling. Lavezzi and Cavallo islands are a must-see before returning to the Italian side of the Strait. Where do we slip moorings? Our boat is docked in the harbor of Cannigione, a small fisherman village in the North-East coast of Sardinia, perfectly located to reach the islands of La Maddalena Archipelago in a few hours sail. We board the boat and have a short briefing for safety and practicalities around 5:30 p.m.
How to reach Cannigione? Read the section "How to get there". Only vegan and vegetarian meals are prepared in the Yogaandsailing galley. We from the staff are all Italian culinary foodies and we keep up our fame: we love to source fresh top quality produce and prepare delicious meals for our guests. If you're vegan or vegetarian and wonder what you'll eat on holiday don't worry, you're in good hands and we know what you want to find in a buffet. The food on board is organic and vegetarian. Over the years, we have developed a network of farmers that deliver us their produce: fruits, vegetables, cheese, eggs, bread and pastries are sourced from permaculture and organic farmers from the region, the rest from organic shops. We also make sure to introduce to you plenty of local Sardinian specialities. On the last day of the trip, you'll get our Yogaandsailing recipe book, to share our delicious meals at home with friends. We often prepare vegan meals for everybody. Vegan, lactose-free and gluten-free alternatives are available all week, let us know your preferences/intolerances and we adapt the menu for you. Alcoholic beverages are not welcome on board, in order to be in line with the yogic diet and give the body a small detox. If you have special dietary requirements please communicate it to us at booking. Please book your flight to arrive at Olbia-Costa Smeralda Airport (OLB). Cannigione is 35 km and 45 minutes drive from the airport. If you arrive on a Saturday, we slip moorings. A common transfer of all the participants to the retreat can be arranged. We can help organize taxis and also put you in small groups as soon as we know your times of arrivals, taxis cost on average 70 EUR one way that you can split with your future travel companions. Please contact us as soon as you know at what time you arrive at Olbia-Costa Smeralda Airport (OLB). Some participants arriving very early on Saturday morning hire a car for the day (you can leave it in Cannigione) and explored the area. That's can be even cheaper than a taxi. If you wish to reach Cannigione by bus we can send you the timetables of the local buses and help you find the best bus connection for you. A reservation requires a deposit of 69% of the total price. 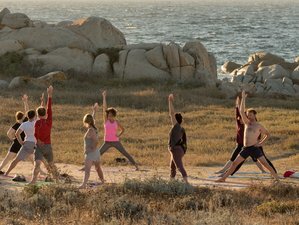 We offer unique recharging and detoxing yoga and sailing retreats between Sardinia, Corsica and La Maddalena Archipelago with organic vegetarian meals all week.